I am very undecided whether or not it needs another border? I feel it does, but for the life of me I can't find any fabric suitable, though I have auditioned quite a few. But then I don't want it to end up too big, because it makes quilting a long and laborious task and borders take forever to do! I know that because I am tussling with one at the moment! I also feel that it needs a few bugs around the flowers in the baskets and on the large side ones, so I am searching my fabrics for suitable bits to attach, but no success so far! I am sorry I am so slow in getting to the next stage, but I am having cold feet about cutting and mitering this border! I know this is quite ridiculous because I have so much of it, but have been quite hit for six by having a whole roll to play with! Almost too much to cope with! I have cut four pieces and washed them in readiness and when I have a quiet day I will proceed. Hopefully it will be soon? In the meantime I am working on other projects, quilting two quilts and piecing another two! Please bear with me, I will get there eventually! probably 20 plus meters of the much sought after border! I am so excited! Of course this is very roughly placed, but I am sure you will agree that it looks good? I'm waiting for the weather to cool down a bit before I start cutting! I don't operate well in hot weather and even with all this fabric I don't want to make mistakes. I also need to wash the border pieces I cut, as the fabric that I already had, did shrink a little! I will also be adding an outer border of a favourite plum/purple Laura Ashley fabric - so still a way to go, especially as I will be sewing the blocks to the floral border by hand! 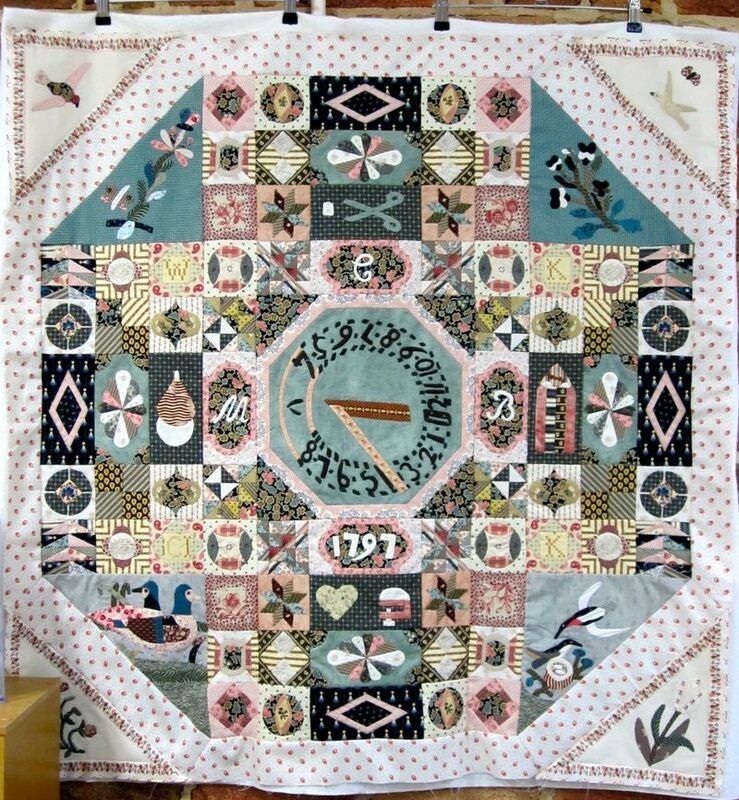 I have been in the Cotswolds for a few days celebrating my birthday and I received an email greeting and attached was a picture of the Laura Ashley border I needed to finish this quilt, asking if this was the one I was looking for! It was the best birthday surprise! Later messages confirmed that a whole roll had been found amongst a collection of fabrics donated to a local quilt group by the family of my friend June Rees. My dear friend June died suddenly last Christmas and her death has affected me deeply and I miss her dreadfully. I knew she had a collection of LA borders because at one time you could buy them very cheaply in their summer and winter sales and June was an early riser who would be there when the doors opened! I lived further away in those days, so that was my excuse for not being there with her, but she would take my list of wants and buy for me! A whole roll of border! I can hardly believe it! Now I have enough to mitre the corners if I decide to and the fact that it came from June makes it so special to me. I know you will understand how I feel? This is a special project and it is now made even more special by being able to complete it using my dear friend's fabric. It feels as if she has left me a gift that she knew I would particularly appreciate. I am feeling very emotional as I type this! Now I have to get on with the project, so watch this space! 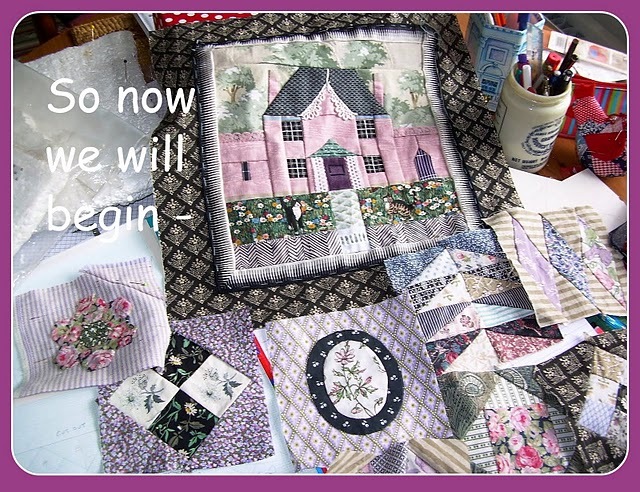 I shall begin again in a few weeks, because next week I am visiting the Quilt Museum in York for the first time and am delivering my Charles and Diana quilt which is to be exhibited there in September and, because I have been away from home, I have lots to catch up on before then! I fear that this project is bogged down again! Though I thought I had enough border I am about 2 inches short and that is using every scrap and not even to try matching! I am feeling very frustrated, so near and yet so far! 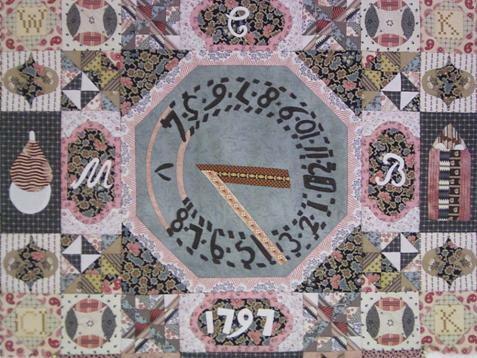 I agree with Susan's comment that not mitering is more in keeping with the era the quilt was made, but the Sundial coverlet has mitering which is a bit annoying! You can see it quite clearly in the above picture and it also has it in other places on the coverlet. 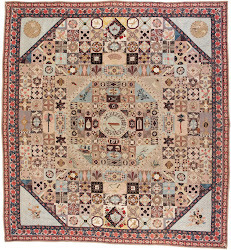 This was on Carolyn's Quilting Room blog as a Block of the Month project. It's looking good - what a mammoth project! If anyone can help I would be extremely grateful? One of my friends has come to my rescue re the vintage Laura Ashley border I am searching for. I could still do with another meter because at the moment I haven't enough to miter the corners. I don't normally do this because, not only is it not usually done on English coverlets, but I hate the faff of it, but in this case I know it would look good. However, unless another piece of border miraculously appears in a fairly short time, I am working on corner piece solutions. Here is Bella, not helping at all! I turn my back and this is what happens! I have been trying out colours for the four corner blocks, you can just see what I have selected in this picture. The large flowers are made of upholstery fabric and have had to be stablised with Fraycheck as they were fraying as I tried to attach them with herringbone stitch. This is a close-up of the Liberty fabric I have chosen for the corners! I am applying little hexagons to each corner piece. They are slightly smaller than the others - I reduced the templates 10% on my photocopier - such a handy tool for patchwork! I love doing these little hexagons to apply but a whole quilt would be a nightmare! Sorry about the creases, they will all have a good press eventually! My publisher wants me to do a little book on this quilt and I am working on ideas, but first of all I have to finish it!